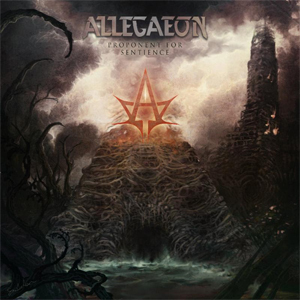 As previously announced, melodic death metal outfit ALLEGAEON will be releasing their fourth full-length this fall; today, the band has revealed details for this album, entitled Proponent For Sentience. Produced by Dave Otero (CATTLE DECAPITATION), Proponent For Sentience is a musically complex, intelligent, and absorbing concept record that can rightfully sit alongside the true greats of the medium. With a lyrical arc rooted in science-fiction yet uncomfortably encroaching upon the reality of the present, it captures the Fort Collins, Colorado natives at their most ambitious and accomplished, pushing the boundaries even further than on their three previous critically acclaimed full-lengths. *Exclusive t-shirts, plus a special collector's bundle (8-string Legator guitar + CD + 2LP + t-shirt + t-shirt) are also available now! "Proponent For Sentience I - The Conception"
"Gray Matter Mechanics - Apassionata Ex Machinea"
"Proponent For Sentience II - The Algorithm"
"Demons Of An Intricate Design"
"Proponent For Sentience III - The Extermination"
For another preview of Proponent For Sentience, please visit: https://allegaeon.bandcamp.com - where the first single, "Gray Matter Mechanics - Appassionata Ex Machinea", is streaming and a full band play-through of "Gray Matter Mechanics" can be seen. Additionally, fans can watch an acoustic performance of "Appassionata Ex Machinea" by Greg Burgess (guitar) below. In support of Proponent For Sentience, ALLEGAEON will join Max & Iggor Cavalera Return To Roots, THE BLACK DAHLIA MURDER, COMBICHRIST, ALL HAIL THE YETI, and ONI for a North American tour this September/October. See below for all upcoming dates!